The internet is a blessing and a curse. One day it offers the perfect video of a baby elephant clumsily chasing birds right when I’m about to fall asleep at my work desk. The next I’m staring at a Facebook wall littered with livid comments because I politely said I think Uber is kind of shady (I get it FB, you love Uber). I’ll end with a blessing, because I’m trying to be more positive in life: Bruno Mars videos. Thanks to a late-night Googling problem, I’ve seen nearly every Bruno video on the World Wide Web. Do yourself a favor: admit that you like Bruno Mars. It will feel good. Don’t worry about being cool. Then go to YouTube. In fact, go now. Go. Now. People had executed beautiful remodels and we had yet to begin. Couples (with golden retrievers!) had been traveling the country. We were still in Lincoln. People had created some great-looking blogs and stores and websites. We had just signed up for Squarespace. After the envy passed, I found perusing “travel trailer remodels” much more comforting. Now, it was more like that feeling you get when your dad offers to help you with something. You’re hesitant at first, but hear him out. His idea doesn’t sound half terrible, so you decide to try it. And then it works, and he’s legitimately helpful. And the project takes half the time. And even though you had to listen to a lot of bad dad jokes along the way and a few off-topic lectures, it feels good that he was there. The internet was just like that. THANK YOU, INTERNET. So, in honor of all those who came before, here’s an incomplete list of the blogs and projects and people that inspired us and helped us. We hope you learn as much from them as we did, and that someday we’re half as good at explaining what we did to Elsie. Mandi named her trailer The Nugget (great name, btw) and has a super helpful master list of posts she created about it. This trailer remodel, featured on design sponge, inspired us to go all white with Elsie. This airstream overhaul, also featured on Design Sponge, pretty much drove us insane. Be prepared for immediate jealousy after the click. Okay, not a trailer. 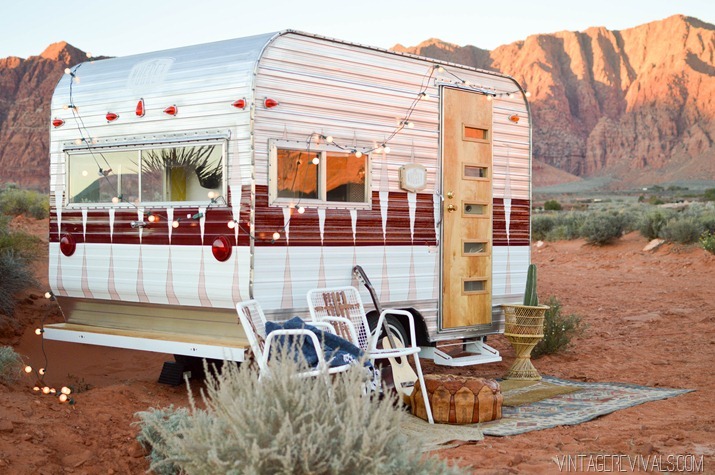 BUT this mobile home remodel would make us v. happy to be “trailer park trash” any day of the week! I know, another “not a travel trailer.” BUT this tiny cabin is EVERYTHING.